The No. 2 Gator softball team lost 5-4 against No. 15 Texas A&M on Friday. 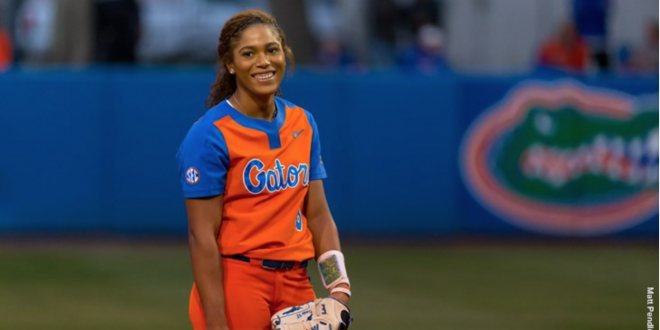 Aleshia Ocasio (21-7) allowed nine hits in six innings including two home runs to center field in the second game of the Gainesville Super Regional. Payton McBride (3-0), the Aggies pitcher who gave up the winning run last night, relieved Trinity Harrington and gave up only three hits in three innings. Gator fans flocked into Katie Seashole Pressly Stadium and watched Florida make costly mistakes early on. With your eyes closed, you could hear simultaneous shrugs and cheers from the crowd. Sarah Hudek hit a solo home run to deep center and over Alex Voss to give the Aggies a first-inning lead. Florida, a team with the second-best fielding percentage in the nation, made bad decisions in the second inning. Ashley Walters hit a double to put pressure on Ocasio in the bottom of the second inning. Riley Sartain hit a routine grounder to DeWitt at third, but the third baseman’s attempt to throw Walters out at second was too slow. DeWitt nearly made up for the out with a leaping catch for a line-drive foul off Kristen Cuyos’ bat. However, another ground ball to DeWitt resulted in another run for the Aggies when Hannah Adams dropped a catch at second trying to turn a double play. Trinity Harrington (13-6) would only allow a hit by Amanda Lorenz in the first two innings. Harrington also started the game in yesterday’s 5-4 loss to Florida. 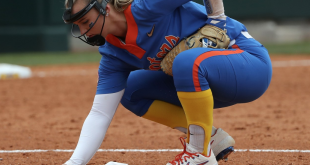 The Gators equalized when Janell Wheaton’s toughness at the plate resulted in a rocket past the third baseman into left field. Lorenz and DeWitt were at second and third following Kayli Kvistad’s out at first. Walton’s hand spun faster than a helicopter propeller, with Lorenz scoring comfortably and DeWitt scoring from second like her life depended on it. 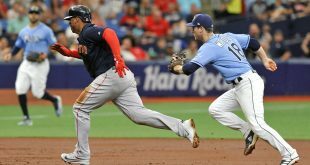 With 2 1/2 innings down, the game was tied 2-2. Ocasio pitched a quick half inning in the bottom of the third, leading to Florida coming back out firing. The fourth inning was a time for hustling, with Jaimie Hoover beating the throw from the shortstop for a single. Additionally, Hannah Adams single to center field when Erica Russell failed to make a diving catch. Sophia Reynoso laid down a bunt to move Hoover and Adams to second and third. Lorenz saw four straight balls and took her base for the second time today, meaning bases loaded with only one out. Harrington would have her final pitch of the day when en DeWitt singled to right field and advanced to second to extend the lead to 4-2. Hudek, who had a wonderful day at the plate, made an error while fielding the hit to allow Lorenz to third. Payton McBride came in to relieve Harrington, but the pressure remained. She walked Kvistad in five pitches to load the bases again but got out of the inning. The Aggies turned the game around in the bottom of the fifth with four straight hits including a three-run home run from Tori Vidales. Similar to Hudek, Ocasio allowed a home run to a similar location in center field for the Gators to go down 5-4. 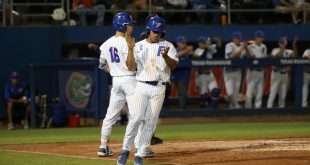 The Gators left 10 runners on base, failing to capitalize in the fifth and sixth innings. 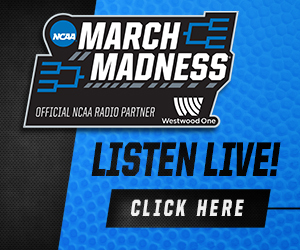 Florida plays Texas A&M at 5 p.m. ET on May 26 to decide who will return to the Women’s College World Series. Head Coach Tim Walton says he hopes to give Amanda Lorenz as many at-bats as possible tomorrow. Lorenz has reached base safely in all 62 games this season. The left fielder is 5-for-5 in the series, including two RBI, a home run, and two walks. Reigning USA Softball Collegiate Player of the Year Kelly Barnhill (28-1) will be on the mound for the Gators.